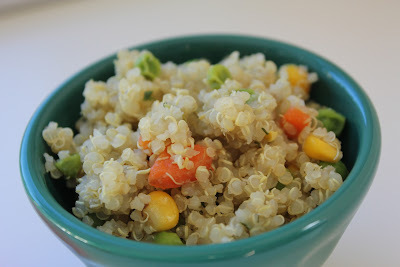 Quinoa is a new-ish to me food that I am trying to incorporate into our diet more and more. Quinoa is a pseudo-grain (technically a seed) that contains all 9 essential amino acids that are not generated by the body making it a complete protein. It can be difficult for vegetarians who avoid soy to consume enough complete proteins so I am trying to incorporate more foods that are complete proteins. Two of my other favorite plant-based complete proteins are amaranth and spirulina! Quinoa cooks up very quickly and can take the place of rice in most recipes. I am really enjoying eating it "pilaf style" which means cooking the quinoa in broth rather than water. I also like adding in chopped carrots, frozen peas, and frozen corn to up our vegetable intake just a bit more! Quinoa pilaf makes a great lunch or dinner side dish and is great served hot or cold. Place all ingredients in a saucepan over medium heat. Cover and cook for 13-15 minutes or until all water is absorbed. I love quinoa! I'll have to keep this recipe in mind.